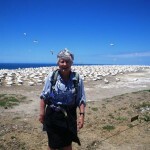 Felicity and I have been visiting the world’s largest mainland gannet colony today. 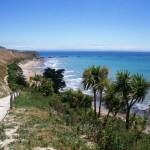 We parked our van at the Clifton Beach campground which is at the end of the road nearest the cape. From here 4WD vehicles and tractors can drive along the beach, so only the hard-core make the two hour walk around the coast. Most tourists travel out on trailers pulled by tractors – there were three out there today, plus about half a dozen quad bikes. When she was four years old, Felicity and her family walked all the way out, so she was keen to re-create the journey. 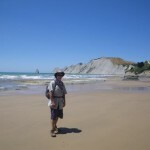 It was quite a hot day, but an onshore wind meant that it was not too uncomfortable being out in the open for so long. 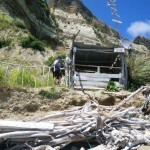 A couple of kilometres before we reached the reserve, we came across a small shelter built mostly of driftwood and junk. The satellite dish and assorted electronic equipment proved to be just decoration when examined closely. 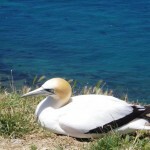 There are four separate areas where the gannets nest, the first being at Black Reef. 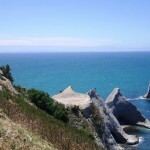 From there it is another kilometre to the information centre at the start of the track up the cliff to the headland. 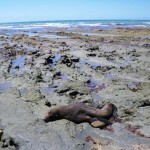 We passed a fur seal relaxing in the sun – it seemed quite unconcerned by our presence. Because we started quite early, we reached the main colony before the main horde of tourists. There was only one young European guy ahead of us who had riden out on his mountain bike. 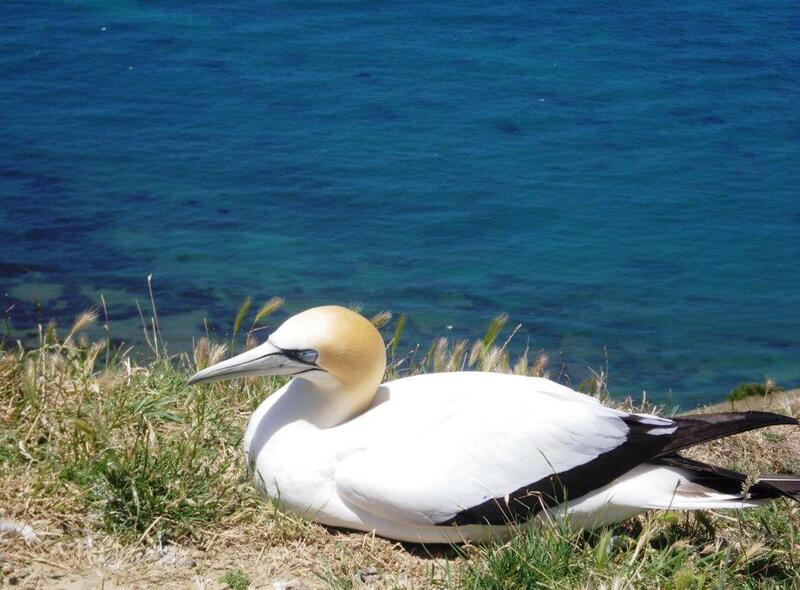 When the gannets are fully mature they fly all the way to Australia, and about 25% survive long enough to return after a few years. 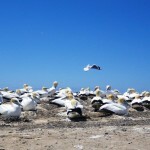 They have been nesting here since the 1870s, but numbers have been increasing rapidly in recent years due to predator control and possibly an increase in small fish numbers due to commercial fishermen taking most of the big fish. By about 1.30 we were back at the attractive information centre where we could sit in the shade and eat our lunch. If the wind hadn’t started cooling us off I might have been keen to stay longer, but we set off for home after about half an hour’s break. 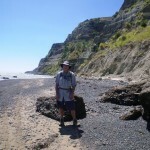 The walk back was spoiled slightly by my boots rubbing on one of the spots where my ankles were ravaged by sandflies on the Mohaka River, but the beach had a few too many stones on it to make walking barefoot a viable option. When we arrived back at the van we jumped in the water for our first sea swim of the season, and were surprised by how warm the water was. We are planning to spend Christmas at this spot since it is so beautiful. There is a decorated tree on the beach a few sites down from us with flashing coloured lights, and some of the campers are wearing Santa hats or reindeer antlers, so there is quite a festive atmosphere. Congrats on doing the return walk Felicity! 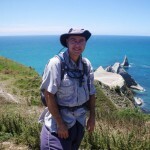 John, your entry on visiting Cape kidnappers takes me back a long way. Felicity may not remember this but as we walked along the beach, the biggest, greediest gannet in the whole colony flew overhead and dropped its dinner middle centre to top of my head. No-one would come near me. And to add insult to injury I had been to the hairdresser just before we left for our walk.